The cheapest international flights to Clermont-Ferrand are on Mobissimo, the free travel search engine. In addition to cheap international flights to Clermont-Ferrand, we help you find the best rates to both major and boutique hotels in Clermont-Ferrand. 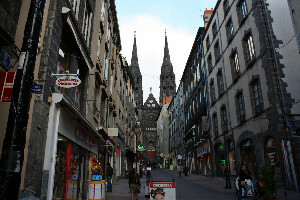 Consider flexible travel dates when looking for the best fares to Clermont-Ferrand, off-season travel or off-peak hours, or mid-week flights are all good options to lower your airline ticket fares. Consider also flying to other international airports in France : Agen, Ajaccio, Angers, Angouleme, Aurillac, Avignon, Brest, Bastia, Biarritz, Bordeaux, Beauvais, Brive-La-Gaillarde, Beziers, Carcassonne, Cannes, Cherbourg, Caen, Calvi, Chambery, Castres, Dijon, Dinard/Pleurtuit, Deauville, Saint-Etienne, Bergerac, Epinal, Metz/Nancy, Nimes, Figari, Grenoble, Croisette, Lannion, Lourdes/Tarbes, Le Havre, Limoges, Lille, Le Puy, La Rochelle, Lorient, Le Touquet, Lyon, Mulhouse, Montpellier, Marseille, Nice, Annecy, Nantes, Paris, Perpignan, Perigueux, Poitiers, Pau, Rochefort, Rodez, Roanne, Rennes, Strasbourg, Toulon/Hyeres, Toulouse, Tours, Quimper, Rouen. Mobissimo is also available on Facebook , Twitter, and other social networks, and our blog post fantastic flights deals to Clermont-Ferrand daily.